Brenda Perlin continues her contemporary romance saga that started with Home Wrecker I, which was acquired by Master Koda Select Publishing and re-released in April. In The Brooklyn Chronicles, Perlin sends her readers on an emotional roller coaster, delving into in the sad and dark times of her main character Brooklyn. Readers praised Perlin's writing, garnering a 4.9 average rating at Goodreads, in Home Wrecker I. From the early reviews, it looks like she has another hit on her hands. Paranormal romance author Jennifer Loiske wrote, "it wasn’t just great it was brilliant!" Tricia Drammah found Home Wrecker II: The Brooklyn Chronicles thought-provoking and "will leave you thinking about the book long after you've finished reading." This story of love, betrayal, and a struggle to keep new-found happiness hits shelves today. And if you haven't yet started this ride, be sure to pick up Home Wrecker I. 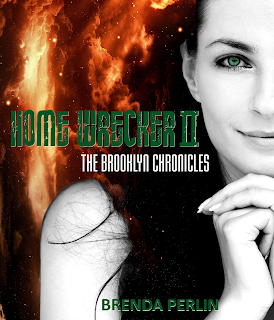 A little peak at what awaits you in Home Wrecker II: The Brooklyn Chronicles. I never planned to be an adulteress, a cheater, or even a liar. I have told plenty of little white lies in my lifetime, but it wasn’t really in me to do anything as unethical as I did. Cheating wasn’t something I even imagined myself doing. It certainly was not in my nature and had nothing to do with my upbringing. I was raised to be a “good girl,” with everything that went along with it, and was taught to treat people as you wanted to be treated. My parents were respectful individuals who never did anything against the law. Well, that is not exactly true; they both had their dishonest moments. My mom had a bad habit of eating candy from the bulk bins in the grocery store as if they were free samples. She thought she could eat at her leisure while she strolled around pushing her grocery cart with one hand and her “freebies” in the other. My dad also had a few digressions that I witnessed on occasion. Once, I caught him changing a price tag to his advantage at Fedco, our neighborhood discount store and another time while we were vacationing in France, I awoke to find him unscrewing the shower head in the hotel’s bathroom. Looking for more information? Check out the Website, Twitter, Facebook, Blog for the Home Wrecker series.